Make Saturdays special with BOGOF Bingo’s £20K giveaway! BOGOF Bingo is offering all their players a share of £20,000 every Saturday. All you have to do is head on over to their main event room between 10pm - 11pm! Saturday evenings can go two ways - you’re either out in town with your mates shooting sambuca, or sitting at home with a cup of tea falling asleep to yet another episode of How I Met Your Mother. Well, if you’re looking for the perfect way to spice up your weekends, BOGOF Bingo has the perfect Saturday night stimulant. 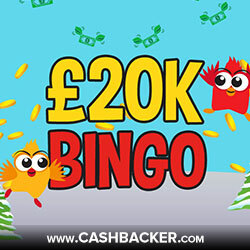 Introducing £20K bingo Saturdays, where it’s possible to win a share of £20,000 from just 50p! Honestly, it doesn’t get much better than this! All you need to do is head on over to BOGOF Bingo between the hours of 10pm to 11pm and dive straight into their main room. 1 x £10K main event game! With tickets for the main game at just 50p a go, you can’t get much better value for money; perfect for the last weekend before payday! Who knows though — you might end up with a bank boosting prize for yourself. If you’re not one to stay up all night for bingo — don’t worry! There’s a whole range of awesome promotions you can find at BOGOF Bingo. Why not head on over and check out their promos for yourself? If you find yourself craving more bingo later on into the night, BOGOF Bingo offers a wide range of games from 75-ball to 90-ball bingo. There’s even a whole room dedicated to free bingo for those who aren’t ready to put cash down. Saturday evenings can be pretty dull - so if you’re looking for the perfect remedy, then click below to get our exclusive cashback at BOGOF Bingo and have your chance to win a share of £20K every Saturday from 10pm!